I’m amazed to say that after nearly 100 hours in Persona 5’s twisted depiction of Tokyo, I never once felt like it was wasting my time. In this time frame, I spent as little time as I possibly could exploring the game’s distorted dungeons and fighting monsters because I knew my friend and unrequited love Ryuji was waiting in the real world for me to join him as he went on a run around our school. Or perhaps instead I could help my former yakuza gun merchant deal with his former employer threatening him and his son. And maybe if I had time to spare that day I would assist Takemi, a local doctor working on a drug to cure a patient’s seemingly incurable disease. These are the things I found always in the back of my mind as I faced revolting shadows in the “Metaverse,” a place where mankind’s distorted desires took shape, but also the place I had the ability to fight the same corruptions at their forefront. Persona 5’s ability to be just as comfortable in the mundane moments of social interaction as it is its stylish combat and the theatrics of its themes is why 100 hours didn’t feel like enough. By the point it was over I still wasn’t satisfied with having not had the in-game time to see some of these stories through to the end. Even so, despite my poor time management skills, Persona never felt padded, and it gave me some of the most memorable moments a game has given me in quite some time. In its first moments, Persona 5 sets the tone for an idea that runs through the game’s entirety: This society is corrupt, and it needs a voice to speak out against it. The protagonist, code named Joker, finds himself in Tokyo after an incident in his hometown defending a woman from a drunkard resulted in assault charges, probation, and relocation to the city. The drunk man, using his connections with the local authorities and a false testimony from the woman, had Joker pegged a criminal, and his record tarnished. Upon arriving in the city, he finds an app on his phone that allows him to enter another world called the Metaverse. Here, people’s distorted views of the world are made plain for others to see, and this honest depiction of how underhanded individuals see the world creates an open and honest stage for the game’s themes. 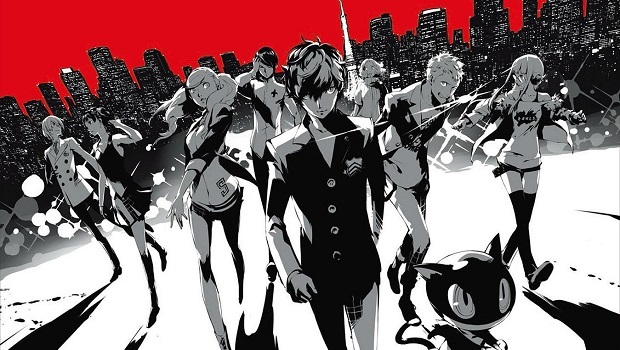 Joker and his merry band of misfits called The Phantom Thieves enter the Metaverse to “steal the hearts” of the morally depraved authority figures they find themselves at the mercy of in the real world. This other world takes the form of how these people see the real one. This can be as on the nose as a volleyball coach viewing the academy where they teach as a castle, or more nuanced depictions like a hermit hacker’s viewing their home as a tomb. After making their way through each of these “Palaces,” the Phantom Thieves steal a treasure that symbolizes the source of these people’s corruption, and then they have a change of heart in the real world, confessing their crimes and turning themselves in. While I didn’t find this quite as impactful as Persona 4’s themes of self-acceptance, I was always excited to see what the next Palace would be and how it would use clever symbolism to really paint a picture of these villains’ clouded worldview. Even if facing these shadow versions of these people didn’t always make me sympathize them, I left every Palace with a new understanding of each of character, and in most cases a revitalized investment in the Phantom Thieves’ fight against corruption as seemingly unrelated people and events became intertwined. This investment was also wrapped up in my growing affection for The Phantom Thieves themselves. Persona 5’s eclectic group of teenagers at its core help make every moment endearing and of consequence, whether they’re as big as taking down a mob boss’ Palace or as small as getting the group together to study. When I wasn’t in the Metaverse, the vast majority of the time I spent in Persona 5 was spent with these juvenile delinquents and their various associates. Spending time each day with any one of these “Confidants” and building my relationships gave me something just as enthralling to do between Palaces. These brief vignettes allowed me to look deeper into the lives of not just the Phantom Thieves, but also several citizens around Tokyo without the pressures of Persona 5’s weighty themes. After school, I could go find Ryuji and train with him, help Makoto expand her sheltered surroundings, or help Yusuke overcome his artist block. These interactions don’t have the same gravitas of the main story, but they made me feel something on a more human level than much of the supernatural symbolism did. If I wasn’t spending time with friends during my free time, I was partaking in activities that would increase my social stats so I could hang out with friends more, as certain Confidants were gated by whether or not my version of Joker was proficient with tools, kind enough to comfort someone, or perhaps bold enough to ask for their help. These social sim elements, coupled with the more benign moments of stat raising, make Persona 5 feel like a proper life simulator and gave me something to do every day of the calendar year in which the game takes place even if I didn’t feel like grinding for experience or infiltrating a Palace. However, it’s worth mentioning that I found myself off put by several of these interactions as the game progressed, opting to mostly focus on a few select characters because of Persona 5’s focus on heteronormative dynamics. As a gay man, I often felt like Persona 5 was doing everything it could to push me away. While the lack of any gay romantic options among the Confidants is bad enough, homophobic comments, caricature depictions of gay men, and the constant insistence that my Joker was interested in women were the most rampant they’ve ever been in the series. While this can be chalked up to a difference in culture, Persona 5 is a game about breaking through the shackles of societal norms, so it felt even more disrespectful and alienating than ever. An example of a Confidant who I stopped seeing altogether was Ichiko Ohya, a journalist looking for information on the Phantom Thieves, which I was the source of. I went to meet up with her thinking we’d delve more into her experience as a journalist, but was forced to pretend I was her boyfriend to give her an alibi for her coworkers. I was so frustrated by Persona 5’s insistence on me conforming to these roles that I didn’t visit her once after in my playthrough. The same is true for characters like fellow Phantom Thief Makoto, who I only kept speaking to because of the potential battle perks of finishing her route. Persona 5’s insistence on fitting the player in these molds feels at odds with its themes and just irresponsible in the face of the message it claims to be presenting. Beyond the social interaction, Persona 5’s Palaces make way for a polished and stylized battle systems I’ve ever experienced. At its core, it’s a fairly straightforward turn-based battle system, complete with rock-paper-scissors style attributes and weaknesses, but it’s made all the more compelling by not only the series’ trademark Persona collection and a carefully crafted aesthetic that makes every moment pop. Each member of the Phantom Thieves and their Persona, a being acting as a physical manifestation of the user’s personality, specializes in different elements. Ryuji covers electricity with Captain Kidd, Ann sets Shadows ablaze with Carmen, and Morgana handles wind attacks with Zorro. While these three and the rest of the Phantom Thieves have a specialization, Joker’s a bit different as he can summon multiple Personas, acting as a sort of wildcard for the group, filling in any role you might find yourself lacking with any team makeup. I personally went with a Persona who I’d spec’d out to be as versatile as possible, giving me a fairly consistent team load out for most of the game. The addition of guns and new elements like nuclear and psychokinetic attacks replace weapon attributes from previous games, though some may take issue with the stripping of old mechanics. Confidant rankings help unlock new skills and tactics, further incentivizing my interacting with the various members of the Phantom Thieves to give me an edge in certain situations. The major addition to Persona 5’s combat comes in the revival of Negotiations, which have been absent in series since Persona 2. Not every battle has to end in a fight, as certain conditions may have wild Shadows begging you to spare them, or perhaps in a compromised position where they have no option but to negotiate. Here you can ask for money, items, or—if you’re of a high enough level—have them join your team as a usable Persona for Joker. In previous Persona games I would run through waves of Shadows without a second thought. Persona 5 gave me a reason to pause and consider other options, and it made the stakes of even random battles feel higher than before. Persona 5 has a way of doing that to me; making me feel the weight of every moment no matter how big or small. Simple things like a random battle can become more than just a slaughter, but potentially the gaining of a new ally. A celebration over sushi with friends feels special because of the people it’s with and the trials we’ve overcome together, and these small instances are wrapped in themes relevant to modern issues. Now that it’s done and I’ve said my goodbyes, each of these memorable moments doesn’t feel like enough. I wanted more time with these friends I made, these Phantom Thieves. Perhaps I’ll see them once more in another playthrough. We’ll do all the things we couldn’t do the first time. Persona 5 brings to light modern issues in a powerful, symbolic story of youthful rebellion. Outfitted with a stylish aesthetic and complex systems, it confidently pulls off moments of grandeur and intimate moments of character growth to create a remarkable experience.